Watch what top organizations are raving about. John DiJulius delivers a powerful presentation, recorded live for Raylon Corporation. 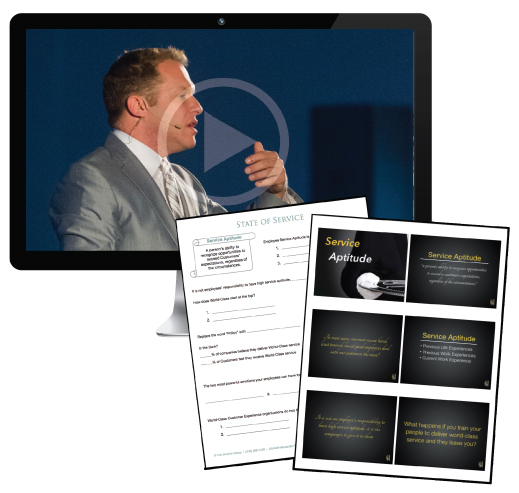 Purchase includes PDF of the slides and workbook to accompany the presentation! International consultant and best-selling author of three Customer service books, his latest book, The Customer Service Revolution (Greenleaf Books 2015), instantly hit #1 on Amazon. John works with world class companies like The Ritz-Carlton, Lexus, Starbucks, Nordstrom, Nestlé, Marriott Hotels, Cheesecake Factory, Progressive Insurance, Harley Davidson, Chick-fil-A, and many more. John isn’t just talking about it, he lives it, as a very successful entrepreneur of two businesses. John Robert’s Spa, a chain of upscale Cleveland locations, has been repeatedly named one of the top 20 salons in America; and The DiJulius Group, a consulting firm focused on changing the world by creating a Customer service revolution. John will demonstrate how we can make our Customer service our single biggest competitive advantage and make price irrelevant!